When was the last time you talked to your alumni via phone? For the Louisiana Tech University Foundation (Louisiana Tech), it had been seven years since alumni were called for a donation. Recently hired Vice President of University Advancement Brooks Hull and Director of Annual Giving Elaine Poynter have a strong background in running successful phonathon programs at previous institutions. One of their first priorities when they arrived at Louisiana Tech was to introduce phonathon outreach at the university. “It’s a channel that we have a strong interest in and we strongly favor it,” Brooks said. Many times, this is the only connection alumni will have with your institution all year. Cultivating a connection between current student ambassadors and your alumni through a phonathon program is an effective and highly personal way to engage and increase the chance your fundraising goals are met. Louisiana Tech decided to partner with Ruffalo Noel Levitz as part of a managed on-campus program and was eager to get started. The team decided to launch the first calling session for seven weeks during the summer of 2016. While nontraditional, it was a strategic decision to help avoid competing with the 2016 U.S. presidential election and get a jump start with outreach—casting a wide net and engaging more recent donors and future donors early in the new fiscal year. A second calling session lasted for six weeks during the winter of 2016. To recruit student ambassadors, the Louisiana Tech Foundation team worked closely with the financial aid office and student contacts prior to the RNL Program Center Manager’s arrival. Once the center manager was on campus, students were efficiently hired and trained. 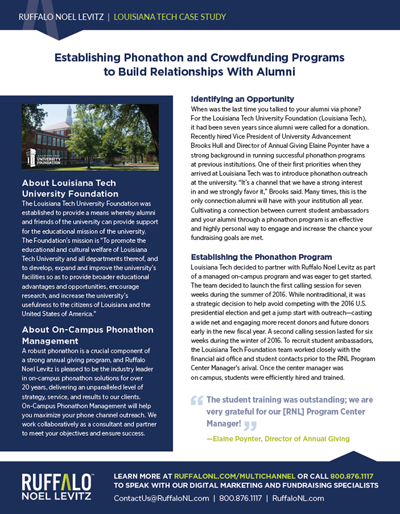 Once the RNL Phonathon program was underway, Louisiana Tech launched RNL Crowdfunding, powered by ScaleFunder, to enhance existing engagement and fundraising efforts. Named after the Louisiana Tech mascot, the Bulldogs, the team branded their crowdfunding as “Bull Market.” They found that better visuals, more social media shares, and stronger product champions translated to a successfully funded campaign. In the first year, the Foundation ran seven campaigns and hope to have six campaigns running at all times in FY2018. Contact us today and ask to speak to our fundraising management specialists. We can discuss how to maximize donor engagement and boost your fundraising results.